Reflecting on my progress in the Innovation Project, I wanted to focus on Communication as my core competency. I thought that from the beginning, we didn’t all know each other in the group, but we found ways to push through and collaborate together, with communication as a key to success. I believe that we were refining when it came to communication. Our group did a very good job of letting others know of absences, or other factors that could’ve affected our efficiency on our project. We were all able to collaborate in an efficient manner by using communication as a way to express ourselves on new ideas that popped up, differences and improvements we could have made. We all gave each other the chance to speak, and express ourselves with how we felt with a new idea, and that’s what kept it a collaborative project, ensuring that the final product reflected what we had all imagined as a solution for a communication device. Collaborating on this project was very fun. We came up with a base idea as a walkie-talkie like device, and throughout collaboration and innovation we were able to come out with the Sunergy 3000. Although it took a very long time, with many adjustments, we all equally found ways to enhance our product to what we were all proud of. 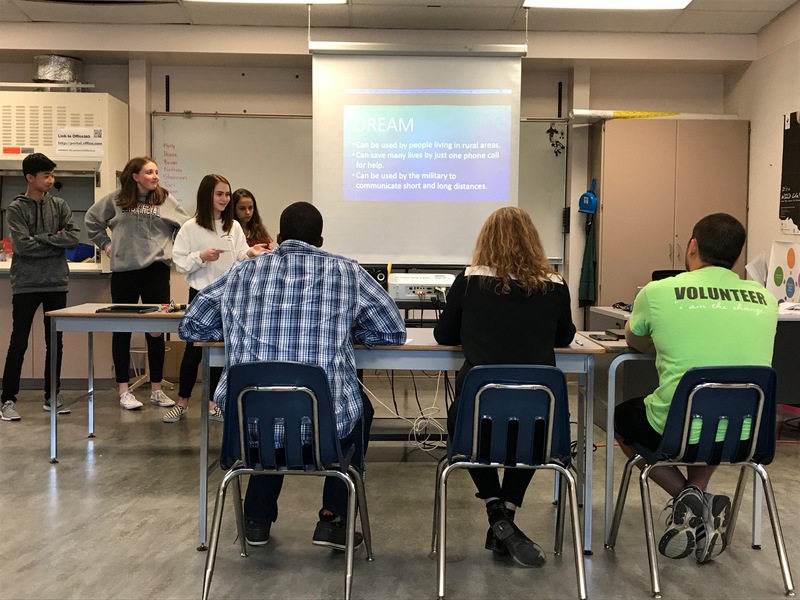 We made sure everyone had an equal voice in the project, ensuring that all of our ideas were put together and that we all listened to each other, gave each other feedback, and worked closely to make sure nobody was left behind or confused. Working on this innovation project turned out to be more fun than anticipated. When we began, the project was not explained well enough and was mixed in with a lot of confusion, but the more we got into the project the better my understanding was. Although the class portion of the project could have been better, the presentation portion of the project was amazing. The judges were able to give very constructive feedback, opening my eye on aspects of our product I had not seen before. The pitching part of presenting really gave me a new perspective on presentations, instead of a boring class presentation it was a business pitch, one that I might actually use in the real-world in the future. It was really fun being able to present our knowledge and exploration in a new form, instead of the boring old class presentations we’ve been doing since grade one. Overall, we were able to complete a project together, using innovation and collaboration and we really got to know a lot more about solar energy and circuitry.